Starry stonewort is a bushy, bright green macro-algae. It produces a characteristic star-shaped bulbil. Thin, bright green branchlets (branch-like structures) can be variable in length and are arranged in whorls (radiating out from a single point) around the stem. Branchlets typically extend in acute angles away from the stem nodes. Tips of the branchlets may have irregularly-lengthed forks or divisions. White, star-shaped bulbils (asexual reproductive structures) the size of a grain of rice form on clear threads at the base of the plant and may be found at or below the sediment surface. Small, orange spheres called antheridia (male reproductive structures) may be visible near the tips of the branchlets. It produces clear, root-like filaments that anchor it to the sediment. Starry stonewort is a macro-algae, meaning it does not have a vascular system like true plants. Each branchlet or stem is a single cell. Native populations consist of both males and females, but all known introduced populations in North America are male. Bulbils are present throughout the growing season, but become most obvious and plentiful in late summer. Starry stonewort may form a dense carpet of material in shallow areas. Starry stonewort is native to Eurasia, from the west coast of Europe to Japan. The species was unintentionally introduced into the United States’ Great Lakes through the discharge of contaminated cargo ship ballast water. The first occurrence in the United States was in 1978 along the St. Lawrence River. It was first confirmed in Minnesota in August 2015, in Lake Koronis and connected Mud Lake (Stearns County). Only 13 lakes in Minnesota are listed as infested with starry stonewort. Refer to the infested waters list for current distribution. It looks similar to many native, beneficial grass-like algae, such as other stoneworts and muskgrasses found in Minnesota lakes and rivers, but can be distinguished based on its production of star-shaped bulbils. Starry stonewort (Nitellopsis obtusa) is a prohibited invasive species in Minnesota, which means it is unlawful (a misdemeanor) to possess, import, purchase, transport or introduce this species except under a permit for disposal, control, research or education. People spread starry stonewort primarily through the movement of water-related equipment. Fragments can get tangled in trailers, motors, anchors and inside watercrafts (boats, canoes and kayaks). Small bulbils, which may be hidden in mud and debris, can stick to trailer bunks, anchors, ropes, fabric, footwear, as well as scuba, fishing and hunting gear. A small fragment or bulbil can start a new population. 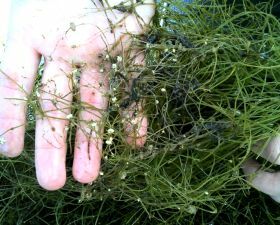 Report new occurrences of starry stonewort to the DNR immediately by contacting your DNR Invasive Species Specialist or log in and submit a report through EDDMapS Midwest. Mechanical control can be done by hand-pulling, suction dredging, DASH (diver assisted suction harvesting) and using other aquatic vegetation harvesting equipment. Herbicide control can be done using contact herbicides (endothall, copper and diquat). Contact herbicides damage or kill only parts of plants with which they come into contact, they are not taken up or moved within the plant.